Here’s an inspiring thought: Your most creative, enjoyable and fulfilling pursuits may lie ahead. By starting a new activity or developing a hobby that engages your mind, you will be able to live your later life to its fullest — while also maintaining a healthy brain. In many cases, adults in their later years are doing more than finding a hobby. They are finding their passions. A septuagenarian who has never taken a brush to canvas may find herself excelling at art. A retired executive who never showed any musical proclivity may take up the violin with exceptionally melodious results. A grandmother who spent years caring for her grandchildren may discover, now that she has time to sit down at a computer, that she has a genuine talent for writing short stories. The notion that people who have reached their 70s and 80s are generally in mental decline can be disproven by seniors who are mastering activities that they’ve never tried before. Those who are fearful that they no longer have the mental acuity to learn something new should be heartened by the latest neuroscientific research, which shows that people can become proficient in new endeavors at any age. Novelty: Doing new things that you have never tried before in order to engage the brain. Challenge: Trying something that has a high enough degree of difficulty that you don’t lose interest. Practice: Putting in the time to learn a skill in order to achieve a higher level of proficiency. Feedback: Gaining an assessment of how you are doing with the goal of improving performance. “With novelty, challenge, practice and feedback, our brains are able to develop new skills, attitudes and strategies at any point in our lives,” Conyers says. Conyers, whose study of the human brain spans three decades, was pleased to see his own mother, Hazel Powell, take on a new endeavor later in life. Discouraged by a perception that she lacked artistic abilities during elementary school, Hazel didn’t discover her true talents until many decades later when she attended an artist’s presentation at a local women’s institute. When the artist called for members of the audience to come forward and try a bit of painting, Hazel overcame her reticence and did just that. That was the spark Hazel needed. Soon she was taking art classes and developing her talent. In the ensuing years, her art was put on display in a local gallery and at restaurants where she lives in Cambridge, England. She’s also had the thrill of selling her art and seeing her work featured in an international magazine. 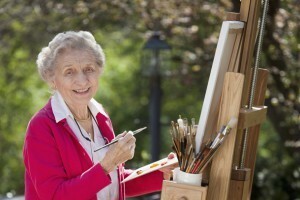 Other hobbies that seniors might enjoy may include gardening, cooking or furniture restoration. Like the creative endeavors previously mentioned, these types of activities can have a positive impact on the brain.